SHIFT CHANGE will premiere in New York City Monday, June 10, 7:30 p.m., at the Anthology Film Archives. The film will be introduced by journalist and GRITtv host, Laura Flanders; filmmakers Mark Dworkin and Melissa Young will host a discussion after the screening. 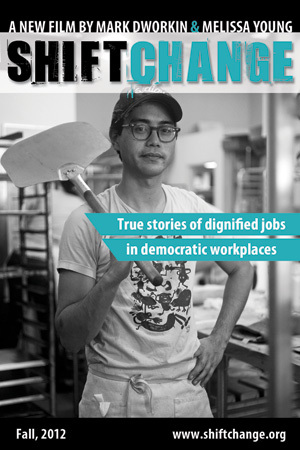 The New York theatrical premiere of SHIFT CHANGE is co-sponsored by SolidarityNYC, New York City Network of Worker Cooperatives, New Economics Institute, Green Worker Coops, Democracy at Work, Toolbox for Education and Social Action, and YES! Magazine. TICKETS: Tickets are $10 and may be purchased online at shiftchangeNYC.brownpapertickets.com. Tickets will be available for purchase at the box office on June 10 (cash only). SPREAD THE WORD: Get the word out about the NYC premiere by sharing it on your social networks! Below are sample tweets and Facebook status updates you can use to let your networks know about SHIFT CHANGE.